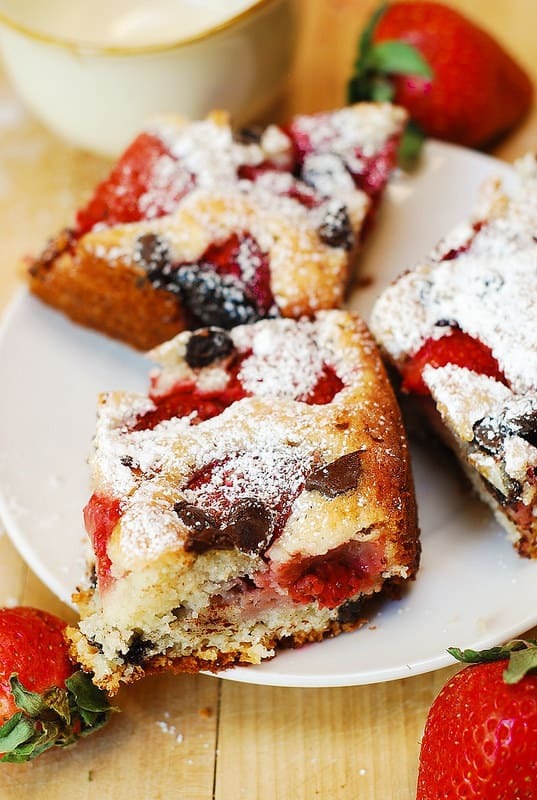 Strawberry Sour Cream Cake Bars with Chocolate Chips – delicious Spring and Summer dessert! 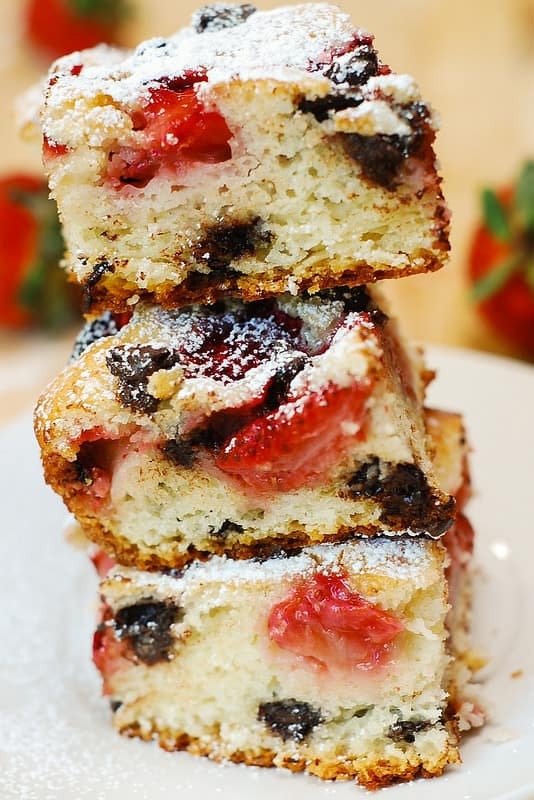 The texture is very light and fluffy, and chocolate chip covered strawberries on top take this sour cream cake to the next level! If you have too many strawberries and don’t know what to do with them – use the strawberries to make this cake! 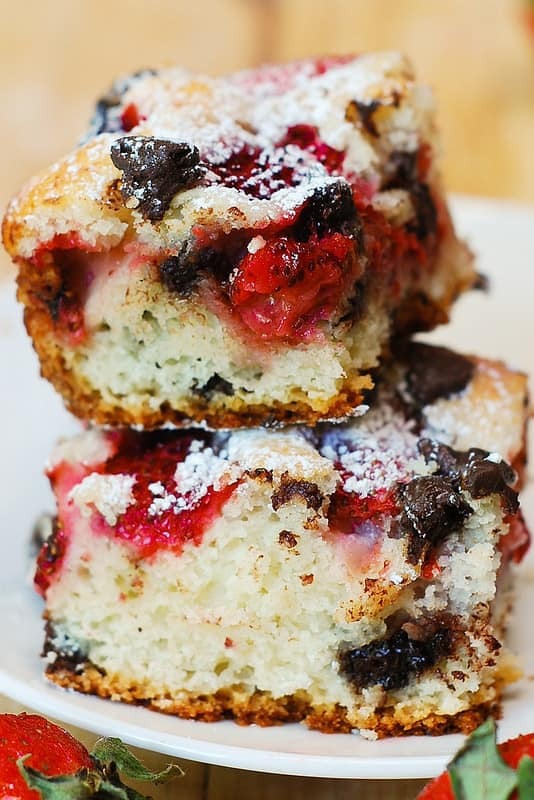 You bake these bars in 9 inch square pan or 9×3 springform round pan. If you double the recipe, then use 9×13 rectangular baking pan! This recipe is so easy to make! No special baking skills required, yet the presentation is quite impressive! Perfect for Spring or Summer entertaining! Delicious, tasty, easy-to-make, with fresh berries AND chocolate – this chocolate chip sour cream cake is so good! 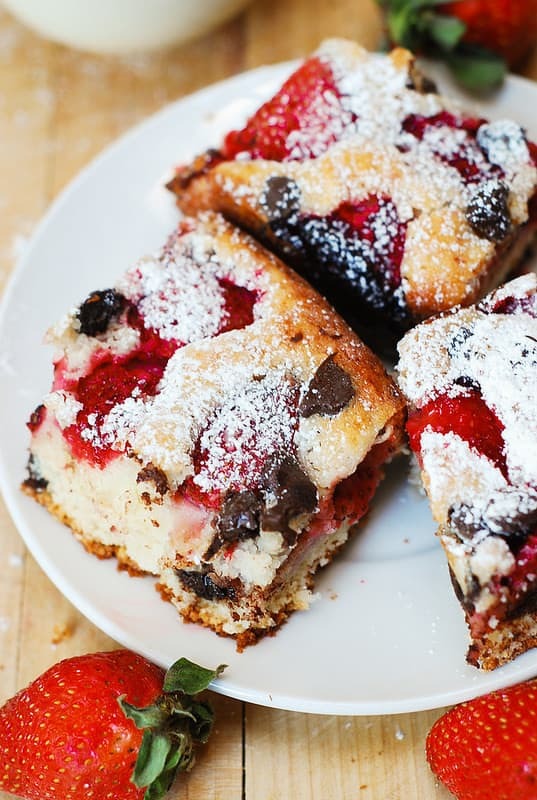 Light and fluffy Strawberry Sour Cream Cake Bars with Chocolate Chips - perfect Summer dessert! Heat oven to 350°F. Line the bottom of 9-inch square pan (or 9x3 springform round pan) with parchment paper. Grease the sides of the pan with butter or cooking spray. In a separate, large mixing bowl, beat together butter, sugar, and eggs, using electric mixer, on medium-high speed until light and fluffy - about 2 minutes. Add sour cream and vanilla and mix to combine thoroughly. Add in the flour mixture into the wet ingredients, keeping the mixer speed low, until combined. Don't over mix. Fold in 1/4 cup of chocolate chips into the batter. Transfer batter to the baking pan. 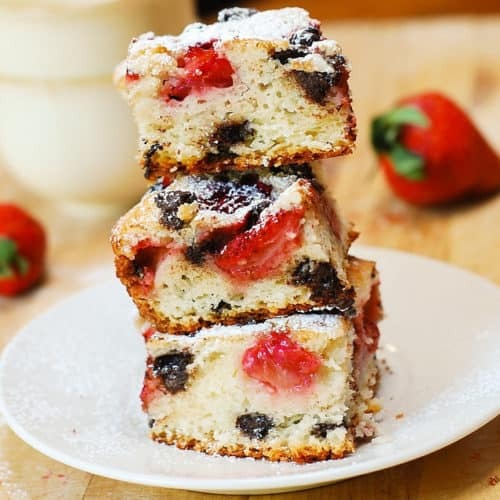 Arrange strawberries on top of the cake, cut sides down and close together. Place the remaining 1/4 cup of chocolate chips in spaces in between. Bake cake for about 40-50 minutes until the top is golden brown and the tester comes out clean. After about 40 minutes of baking, you can take out the cake and sprinkle some more chocolate chips on top, pressing them lightly into the top of the cake - it will make for a nice presentation. Let the cake cool in the baking pan on a wire rack. After cake has cooled for about 40 minutes, release the cake from baking pan. At this point, if the cake is cool enough, you can slide your hand under the cake, between the parchment paper and the bottom of the pan and move the cake with the parchment paper attached to its bottom onto a serving plate easily. Perfect timing! I was just craving something sweet and now I know what to prepare for the weekend. Don’t mind if I do! These cake bars look perfect for spring! I can’t get enough strawberries at this time of the year and this is a great way to use them! Scary compared to your cake bars…. 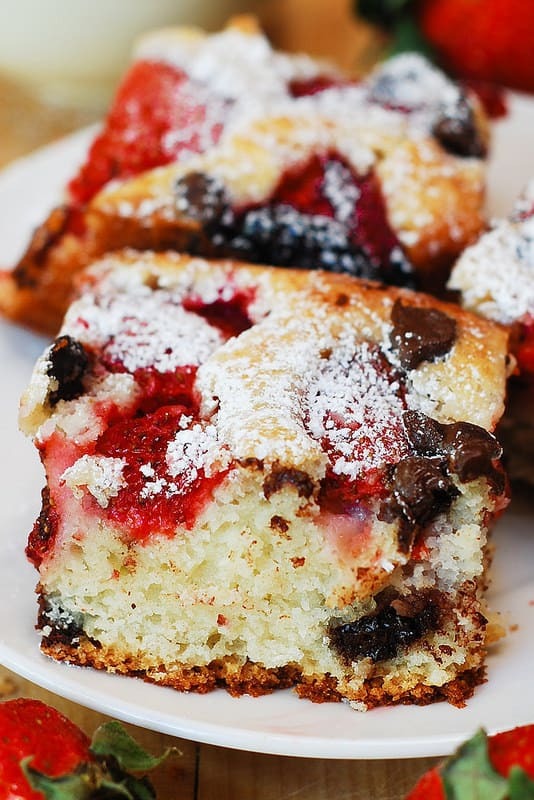 I don’t know which I like more – the berries or chocolate! These bars sound delicious!